Former President George H.W. 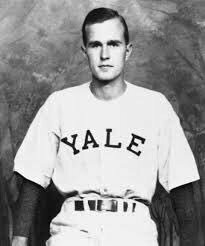 Bush during his time at Yale University in New Haven. Washington – Work in Congress was halted on Monday as the body of former President George Herbert Walker Bush arrived here as part of funeral services that will be held throughout the week. Bush’s coffin will lie in state in the U.S. Capitol rotunda on the catafalque constructed in 1865 to support the casket of Abraham Lincoln. Rep. John Larson, D-1st District, said he planned to attend the viewing on Monday night. “We’re proud to say that he hailed from Connecticut,” Larson said. The nation’s 41st president died on Friday at the age of 94. Bush was born in Milton, Mass, but his family moved to Greenwich, Conn., shortly after his birth. His father, Prescott Bush, represented Connecticut in the U.S. Senate from 1952 to 1963. After serving in the Navy during World War II, the former president attended Yale University, receiving an undergraduate degree in economics. After graduating from Yale, Bush moved to Texas, venturing into the oil business, and eventually into Republican politics, becoming Ronald Reagan’s vice president and serving one term as president. Larson said he met Bush when the congressman was the head of the Connecticut state Senate and the president invited all state Senate leaders attending a conference in Washington D.C.in the early 1990s to the White House. Trump also followed protocol by sending the blue-and-white presidential jet to pick up the former president’s coffin in Texas and bring it to Washington. Trump will attend the funeral service for Bush at Washington’s National Cathedral on Wednesday, but will not deliver a eulogy. That has been left to his son, former President George W. Bush, and former Canadian Prime Minister Brian Mulroney, former Sen. Alan Simpson, R-Wyo , and Bush biographer Jon Meacham. Connecticut’s U.S. senators, Richard Blumenthal and Chris Murphy, also plan to attend the service. “Our thoughts and hearts go out to his family, some still in Connecticut, which is proud of his early years and family roots here,” Blumenthal said. Bush’s death prompted the U.S. House to cancel all work this week. The Senate has postponed its work until Wednesday afternoon. The deadline for a new spending bill to keep the federal government operating is Friday. But with Washington consumed with memorials to Bush, the White House and congressional leaders are trying to work out a deal to extend government funding until Dec. 21. That would set up a shutdown fight over Trump’s border wall until right before Christmas.